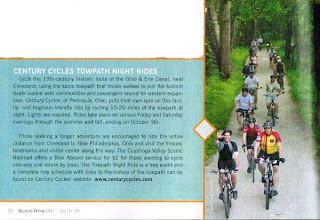 The latest issue of Bicycle Times Magazine mentions our Night Rides on the Towpath Trail in their Bike Socials / Events section. Bicycle Times is the new commuter/urban-oriented magazine from the same folks who bring you Dirt Rag, the mountain biking magazine. Find both at your favorite news stand or book store today! The issue also features a review of the Raleigh Clubman bicycle (which we have in stock in all three of our stores now), plus a comparison of blinky lights, including one of our favorites, the Planet Bike Superflash. Of the Raleigh Clubman, tester Eric McKeegan says, "There really aren't that many bikes on the market like the Clubman. It's a shame really...It takes a page from '70s and early '80s road bikes, and updates the idea with modern frame geometry and components, without losing the practicality that has kept many of those bikes on the road today." Thanks to Doug for the photo!